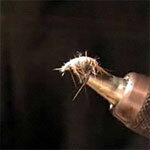 New on MidCurrent this week, Michael Yelton demonstrates how to tie a Gray Scud. Not an insect, but a shrimp-like freshwater crustacean, scuds are a key trout food source in slow-moving, nutrient-rich streams. Scuds can vary in size from less than 1/8 inch to more than an inch, and can be cream, olive, tan, or almost black in color. This gray version is a “general-purpose” choice, but anglers will often produce fish by using a variety of more vibrant colors, particularly orange or pink-orange.